Disclosure: The writer may have received a product for free as a condition of this publication. Regardless, all the opinions are those of the writer. This post may contain affiliate links that would compensate me if you make a purchase after clicking on my links. Offers change or can be removed at any time without notice. Contact Frugalshopping1@gmail.com for questions or to have your product featured on this blog. Tickets are on sale now for Moscow Ballet’s celebrated Great Russian Nutcracker on most cities on the 2015 North American tour! It’s the ultimate holiday tradition from the youngest to the seniors in the family. 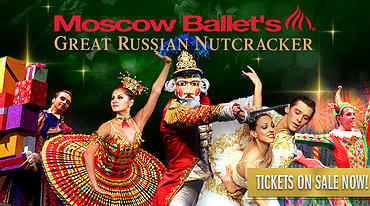 See Moscow Ballet’s Great Russian Nutcracker and create memories for a lifetime. The company of almost 40 dancers is the only internationally touring ballet group to perform to critical acclaim in over 75 North American cities annually. The renowned, award-winning principal dancers and corps de ballet thrill audiences with their expertise, dramatic expression and stunning leaps, turns and drops. The production is known for its dedication to world peace: naming Act II the “Land of Peace and Harmony;” featuring a rose shooting cannon and a stunning “Dove of Peace” with a 20’ wingspan. All ages feel the spirit of the season at the Great Russian Nutcracker through the romantic costumes and shimmering backdrops splashed with highlights of Russian history. Additional fanciful effects include life-sized Matrushka Dolls; 3-headed Rat King and authentic Troika Sleigh escorted by Father Christmas and Snow Maiden through the magic Snow Forest. Get the deepest discount of the season (up to $30 OFF!) with the exclusive US Family Guide PROMO CODE: SANTA CLICK HERE for ShowTimes and Ticket Information.